WHAT IS REAL TIME TRAFFIC INFORMATION? Real Time Traffic Information (BMW RTTI) - available for all BMW models MY2011 or newer - keeps you updated on the traffic situation as it develops and to the nearest 100m. The system also calculates what delays are to be expected and recommends detours. This keeps you precisely informed of the traffic situation on the planned route and potential alternative routes at all times. As a result you can react to tailbacks and road closures in good time and avoid them. In which countries is RTTI available? BMW RTTI is available in Germany, UK, Italy, France, Belgium, Luxembourg, Czech Republic, the Netherlands, Austria, Spain, Denmark, Finland, Ireland, Norway, Poland*, Portugal, Sweden, Switzerland, Turkey*, US*, Canada*. Life time activation of RTTI in these countries only as long as RTTI is available for the country and navigation system. For which BMW modells is the update available? Which navigation systems are supported? Life time RTTI activation in supported countries* is available today for: CIC Navigation system (Premium road maps) and NBT Navigation system (NEXT road maps). A road map update may be required depending on the introduction date of RTTI in the country. NBT EVO and other navigation systems aren't supported currently but could change in the future. How to check installed road maps? To check the version of installed road maps, press the "NAV" button on the idrive controller. Then press the "Options" button and scroll down. Select "Navigation system version". When is a software update of the car required? A software update may be required (not included) when your BMW is older than MY2011 and never has been updated by BMW service. Which options must my BMW have to be able to enable RTTI? To be able to enable BMW RTTI a wide screen navigation system (CIC or NBT, option 609), a telematics module and a one time activation of BMW ConnectedDrive is required. It's very important to check all prerequisites to prevent disappointments. The VIN checker will check if you have required options in the option list. Please read the whole FAQ and contact us when you have questions which are not answered. *Services also available in CD portal. How can I check data connection of my BMW is compatible? Disable Bluetooth and start via iDrive BMW ConnectedDrive. When BMW Online or the the BMW ConnectedDrive Store is shown, your BMW is compatible with this update. In case BMW Online or the the BMW ConnectedDrive Store is not shown, try to update the ConnectedDrive services via iDrive - ConnectedDrive - option - Update services (or Update BMW Assist). When Update services is greyed out, the data connection via CarSIM isn't active. In this case try register your BMW on the BMW ConnectedDrive portal and follow the steps provided by the BMW ConnectedDrive Portal. Is it possible to use a bluetooth connection? When you use Tethering (data connection via Bluetooth of a mobile phone) for ConnectedDrive services it's not possible to enable RTTI. Only BMWs with active data connection via the CarSIM (requires a telematics unit and an active ConnectedDrive service) can enable and use RTTI. 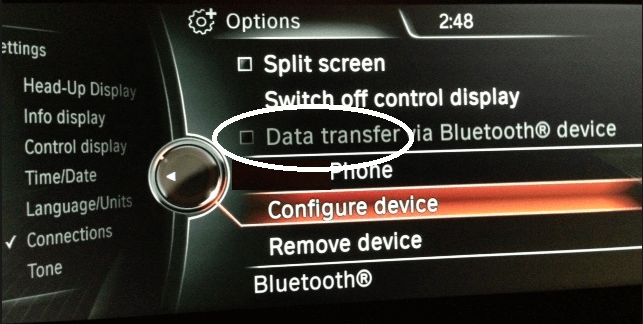 When the option Data transfer via Bluetooth device is visible (iDrive - Options), the data connection of the CarSIM isn't active (anymore). The message "No data connection possible via the mobile network. Try later or on another location." is a problem with the coverage of the mobile network. Possibly a failure of the mobile network. Your BMW can't connect with the mobile network. RTTI is not available in this situation and your BMW will try to use other traffic information resources like TMC when available in your area. Possibly an issue with BMW ConnectedDrive exists. Why do I need to Register my BMW in ConnectedDrive Portal? If you don't have options like Intelligent Emergency Call (S6AC) or Remote Services (S6AP) in your option list it's not possible to validate whether the CarSIM of your car is active. In order to validate the CarSIM of your BMW is active the easiest way to check this requirement is to register your BMW in the BMW ConnectedDrive portal. In case the registration should fail, the BMW ConnectedDrive portal will guide you further. Or contact the BMW ConnectedDrive customer services of your country. Can you 100% guarantee the update will work on my BMW? 100% guarantee doesn't exist anywhere when techology is involved. We have a 100% ratio of enabling RTTI on compatible BMWs regarding finished updates in supported countries. So the update will work when you follow the instructions precisely and in case it doesn't work immediately we will do our ultimate best to make it work. If your BMW does meet all prerequisites and has mobile network coverage with an active data connection via the telematics unit, don't worry we don't stop until you are happy. My car is incompatible. What are my options? Our VIN checker provides detailed information regarding the area of incompatiblity (your car doesn't meet minimum requirements). Most of the time incompatibility is related to an incompatible navigation system and/or missing modules (e.g. Telematics unit). The only way to solve this issue is to retrofit required modules which means replace incompatible modules and/or add missing modules. Contact your BMW dealer for details. Does the update work with a retrofitted navigation system? In case of a retrofit - the navigation system and/or other components of your BMW were installed or replaced with another model after delivery of the car - activation of RTTI is still possible when the retrofit of the navigation system and telematics unit is 100% compatible to original. This means that all required components must be present and configured to use the original VIN of the car and 100% equally configured with the factory defaults and have an active data connection via the Car SIM. Your order will be processed within 3-5 business days after we have received the payment. Most of the time we deliver faster, but to avoid any disappointments we use this number of days. Don't forget to check your SPAM folder if you don't find the activation in your inbox. What exactly will be delivered? The update will be delivered electronically as software package. You have to copy the update to an USB thumbdrive (not included). In the occasion addtional items have to be delivered, you'll find the details in the shipment notification. Your payment is processed via PayPal and your purchase is protected with the PayPal Purchase Protection. Be sure you really want to purchase the item(s) in the shopping cart before completing the payment transaction. I have questions regarding BMW ConnectedDrive? When you have more questions, please use the contact form. Please include last 7 charachter of chassis number (VIN). For other questions please contact the BMW ConnectedDrive portal of your country.